I love watching B-Roll of ramen restaurants. It’s one of the main reasons I will watch documentaries on ramen. One of my favorites is here, on a channel I supported through Patreon. It’s one of the main reasons I am so jazzed for the upcoming Ramen Heads film. If you haven’t heard much about it, you will. Add measured proportions of seasoning, tare, and aromatics to bowl. Pour in prescribed amount of unflavored broth into heated bowl to mix with seasonings and sauces. Arrange artfully depending on region and style of ramen. Apply drizzle of aromatic oil. Give some utensils and present in grand Japanese gesture to your customer. One of my favorite ramen videos is from a channel I decided to support on Patreon, the Life Where I’m From Youtube Channel. Here is Greg’s video, What Owning a Ramen Restaurant in Japan is Like. Even better is the Director’s commentary found in his Life Where I’m From X channel. I find myself mesmerized by this seemingly ubiquitous method of making ramen. Taking an unflavored broth right up to the point of serving the soup seems to be uniquely Japanese and unique to ramen (please correct me if I am wrong). I have wondered why they would do this. Chicken noodle soup is not unseasoned broth just before serving, nor is ramen’s close cousin, Pho. Almost all other soups served in restaurants are seasoned for the end result from the very start of the process. After some thought I came up with 3 very good reasons. Freshness – flavors like volatile aromatic oils and fresh herbs and fish powders will meet for the first time just minutes before the customer gets them. This provides a unique and unparalleled experience for the consumer. The dish changes by the second once it is handed to them. 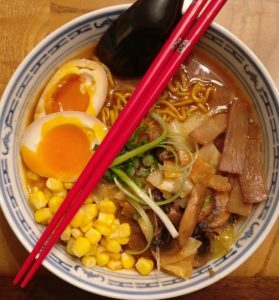 Variety – Once a ramen shop decides that they want to present a variety of soups, shoyu, miso, and tonkotsu as well as spicy variants of each and of course dipping noodles, having one broth that is seasoned for each order has its advantages. Instead of 3 stockpots going, there can be one large stockpot with all of the broth for the day. This is likely more applicable to lighter broths and not so much the stinky pork bone tonkotsu that is an absolute bear to season. One broth and a shoyu seasoning sauce (tare), a miso tare, and a shio tare is possible given this setup. Scalability – this to me seems to be the biggest reason. Restaurants do not usually have high demand from open to close, so being able to dial up or dial down your response and output seems to make sense to me. Keeping things modular means that on a Tuesday you could make 10 bowls whereas with the same setup make 150 bowls on Friday. With the same setup you could also perform pilot-scale experiments with your food and come up with new products. You could offer 40 bowls of new ramen X while ramen A is selling like hotcakes but the weather has changed and ramen B isn’t selling so well. Again, this is variety, but also scale.